This New Zealand and Cook Islands Vacations: Beach and Adventure package is perfect for the weekend warrior. This one was planned for a couple from Virginia who had only a week for their vacation. They wanted to have some outdoor adventures in New Zealand, but also relax on the beach. Next for their New Zealand and Cook Islands Vacations: Beach and Adventure package, they flew to Queenstown on New Zealand’s South Island. Nestled on the shore of Lake Wakatipu and surrounded by the Remarkables mountain range, Queenstown offers breathtaking views at every turn. It’s also known as the adventure capital of the South Pacific and a world-renowned bungy jumping destination! They had 3 nights in Queenstown completely at their leisure. They enjoyed lots of hiking in the mountains, a day trip to the beautiful Milford Sound, quad biking, and a boutique winery tour in the nearby Central Otago wine region. Continuing their New Zealand and Cook Islands Vacations: Beach and Adventure package, they flew to Rotorua. This North Island town is known for its volcanic landscape, with interesting rock formations, steam vents, and boiling mud pools. They did some hiking through the geothermal wonderlands here and were able to see a traditional Maori haka dance. Then, they drove up to the capital city of Auckland. They overnighted in Auckland and had an evening to explore the trendy bars and restaurants. The next morning, it was time to say goodbye to New Zealand and begin their journey back home. Welcome to the Cook Islands! Stay at the fabulous Muri Beach Club Hotel on the main island of Rarotonga. This adults-only resort puts you right at the heart of one of Rarotonga’s most outstanding natural features: Muri Lagoon. The lagoon is Rarotonga’s aquatic playground, superb for snorkeling and swimming. With other water sports like kayaking, wind surfing, kite surfing, sailing and glass-bottomed boat rides, there’s always an opportunity to get out on the water and away from it all. Today is yours to spend at your leisure. Renting a scooter is a great way to see the island of Rarotonga and explore hidden beaches. You can also choose to have a delicious and authentic dinner with some local families on the island. Or, simply relax by the pool at your beautiful resort. Say goodbye to the Cook Islands and hello to adventure-filled New Zealand! 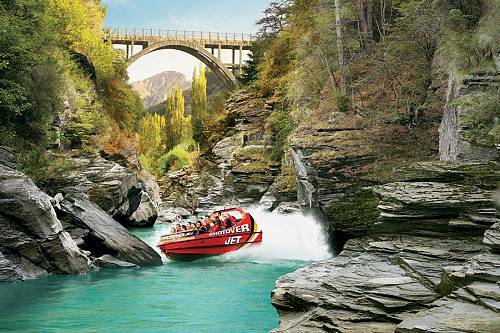 Your first stop is Queenstown, the adventure capital of the South Pacific. Nestled on the shore of Lake Wakatipu and surrounded by the Remarkables mountain range, Queenstown offers breathtaking views at every turn. Your time here is at your leisure to enjoy the many adventures on offer, including hiking, bungy jumping, mountain biking, quad bike tours, jet boat rides, Lord of the Rings scenery tours, and much more! The iconic Milford and Doubtful Sounds, plus fabulous wineries in Central Otago, are great for day trips. Take a short flight to Rotorua and pick up your rental car. Rotorua is a geothermal wonderland and a sacred place for New Zealand’s Maori people. Around Rotorua, you’ll find adventure, caving, blackwater rafting, glowworms, and fabulous landscapes. Perhaps explore the fascinating natural attractions at Waiotapu Thermal Wonderland, including colorful sulphur formations and boiling mud pools. Experience an authentic Maori feast and haka performance at Te Puia. You can also take a helicopter excursion to White Island and tour the active volcano! Drive north to the capital city of Auckland today through scenic North Island farmland. Enjoy the evening in Auckland, perhaps exploring some of the fabulous shops and restaurants along the bustling Viaduct Harbour. Today, your wonderful Cook Islands and New Zealand vacation comes to an end. Drop off your rental car at the airport and board your flight back home. After a trip across Lake Wakatipu on the TSS Earnslaw, pull up a chair and enjoy a pint with the locals at Atlas Pub on Steamer Wharf. A boutique bar that’s about the size of your kitchen is the watering hole for locals after a hard day at work/mountain biking/paragliding/kayaking. To ensure you don’t go hungry, the tapas here are great as well, but the best thing…the $18 steak! It’s the best steak in town and what a price! A tasty piece of NZ beef, jus, fries, garlic butter, and salad will keep your whole party happy. Enjoy the last of the evening sun, which if you’re lucky enough will paint the landscape with a lovely amber glow as it sets behind the mountains in front of you. The pub is abundant with friendly locals who are always up for a chat, so pull up a chair and start talking!